I was four years old the first time I heard Jesus Christ Superstar. At least, I think I was four; I have no pre-JCSS recollections. I remember jumping up and down on my sister’s bed listening to the song “Pilate and Christ.” Jesus was being whipped. I asked my sister what was going on and she told me. I thought that Jesus must have done something just terrible to warrant such a brutal punishment. My parents didn’t even spank me. I have written extensively about my love for JCSS. In my book, The Many Deaths of Judas Iscariot: A Meditation on Suicide, I document the role it has played in my life: I starred as Pilate in my high school production; I saw the late, great Carl Anderson play Judas three times before his untimely death; I was listening to the rock opera when I received the call that my beloved brother Stephen’s body had been pulled from the Ohio rive after a successful suicide attempt. I had the JCSS angels tattooed on my arm in honor of the tenth anniversary of his death. So when I learned that Ted Neeley, who has played Jesus for over 40 years, and Barry Dennen, the original Pilate on the concept album and the actor who filled the role in the film, were coming to my sleepy hamlet of Yellow Springs, Ohio, to appear at our local movie house, The Little Theater, a business my family owned for almost a decade, I was thrilled. When two wonderful members of my congregation gifted Miriam and me VIP tickets, I was ecstatic. When I realized that the visit would correspond with my sister’s 50th birthday, I thanked God for the serendipity. I purchased Melissa, my sister, a VIP pass, and went about putting the event out of my mind because, really, how does one prepare to meet Jesus? It has been a rough 2015 for me as a result of things I can’t really talk about; such is the nature of ministry. On Thursday night, I was leaving a hard meeting and in deep thought, ready to drive away in my Prius when I heard a frantic knocking on my window. I looked and there was one of the congregants, Gilah, who had purchased my ticket. She loves JCSS as much as do I, and the look on her face was all business. “Get out of the car, Aaron. Come on!” she said. For a moment, I forgot how to open a door. It can’t be, I thought. Walking across the street, I looked through the front window of a local eatery, The Sunrise Cafe, and I saw them. Jesus and Pilate, sitting side-by-side, one sipping a whiskey, the other in mid-story. As the door clattered behind me and I rounded the corner, I was greeted with a loud, “There he is!” and great laughter. My reputation had preceded me. I doubled over, putting my hands over my face. I might be 38 years old, but in that moment I was 4, jumping up and down on the bed again. 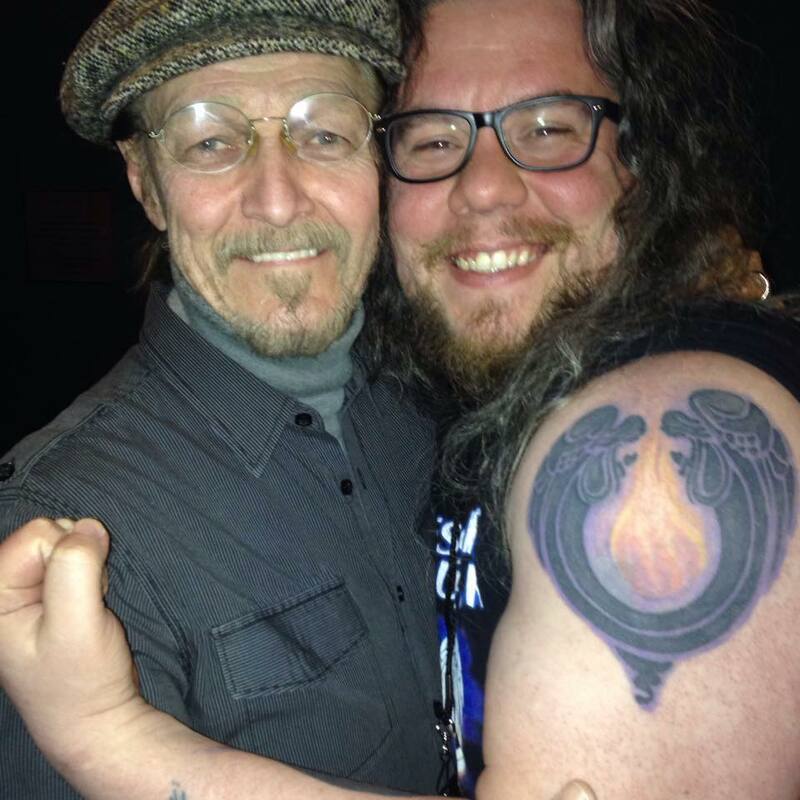 I think I might have the best “So, what happened when you first met Ted Neeley and Barry Dennen” story, as they both demanded to see the tattoo. Within three minutes, they had me half naked in the middle of the restaurant, showing the ink. We settled into a lovely conversation with Frank, their tour manager, and two longtime friends, one of whom is a fellow UCC minister. Both Ted and Barry wanted to know all about my brother, all about how JCSS has changed my life. They were more interested in talking about that than they were themselves, a fact I now know should not have surprised me. Both of them are genuine, warm, compassionate people who have a true desire to listen to others. I could fill this blog with stories from the next two days, from the VIP experience to Ted demanding my phone number so that we can talk about my book once he finishes reading it. But to me, the most amazing thing that happened over the weekend was when Ted came to my church to participate in service. Late the night before he had spoken to Gilah, who was the coordinator for The Little Art and was, next to Frank, the tour manager, the one most responsible for getting Ted and Barry where they needed to be on time; he asked her, with his hand upon her arm, “May I go to church with you?” So when he walked down the hallway, looking dapper in his pinstriped vest and grey tie, I felt a shift. For most of my life, Ted had ministered me without even knowing. I have lost count of how many times I’ve seen or listened to JCSS. It is not an exaggeration to say it is in the thousands. Many of those listens were done out of need, out of a compulsion to enter that space where my spirituality feels most validated, most expressed, most authentic. Here, now, God was giving me a chance to minister to Ted. The Spirit moved through our little church that Palm Sunday, with the children waving their palms and taking up a noisy offering; without trying to observe Ted, I caught his smile several times and heard him laugh when a precocious little girl toddled up the steps to the pulpit, extending her large tin can to me and demanding I drop in coins. Ted picked up his palm and waved in response to this, and I thought of the “Hosanna” scene in JCSS in which Jesus (Ted) is surrounded by children, all palms and smiles. My heart leaped; I said a quick thank you to God. When the time came for Communion and Ted made his way to the table to receive the Eucharist via intinction, we held eyes for a few seconds. I said, “The cup of peace, offered for you, Ted.” He smiled, dipped his bread, looked at me again, and said, “Bless you, Aaron.” In that moment, he was not Jesus. He was not TED NEELEY, he was Ted. A child of God. A man seeking Jesus. A member of the flock. If a man is going to play the role of Jesus for going on 50 years, you want it to be someone like Ted Neeley. One need only spend a few moments with him to know that his heart is genuine, that he is intensely interested in hearing the stories of others, and that he has the ability to really see who a person is; I watched him interact with others, and it seems like the world just melts away when he looks at people. He connects. He gives long, lingering hugs that fill you with joy and warmth. He gives and gives and gives, feeling truly blessed to have been chosen for the role of a lifetime. And I don’t mean playing Jesus.